Hannah had a very big accident today. The accident itself (falling out of her high chair) doesn't seem nearly as scary as, say, rolling down the stairs, but the end result was way worse. 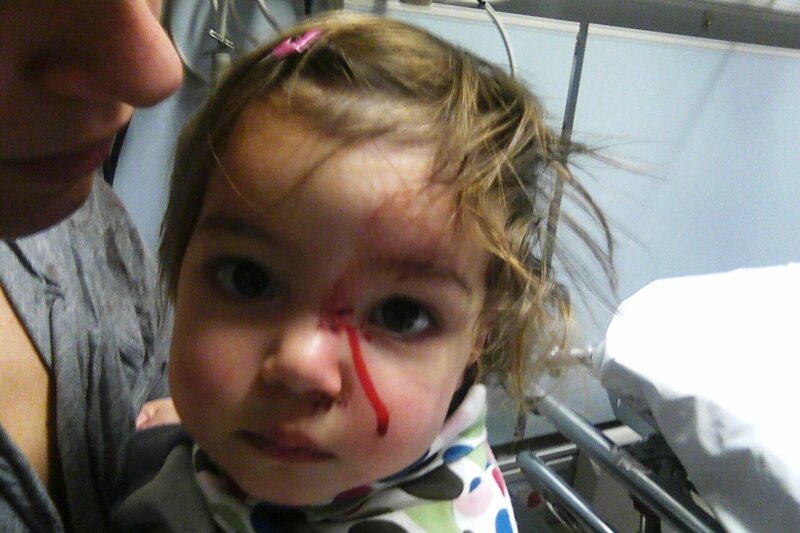 This small fall left her with a gash in the bridge of her nose, a trip to the ER, and a stitch. I wish I could tell you what happened, but neither me nor Laura really saw it. Hannah was in her high chair just hanging out and finishing up her lunch. I had wheeled her over to the sink and pulled the tray off to wash it along with the lunch dishes. Laura was sitting at the island getting ready to eat some turkey pot pie. 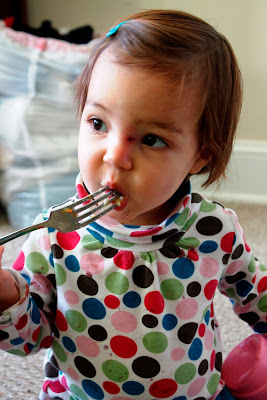 The very instant that she looked down at her fork, I turned to put a plate in the sink and then, THUD, we tossed our respective fork and plate to find Hannah on the floor screaming AND bleeding. We're guessing that she was reaching for the door of the fridge and rolled out over the mini tray that is built into the chair (it's very small and short because it fits beneath the regular sized tray). I've never seen her bleed before, but still my immediate reaction was relatively calm, which is impressive for me because I tend to freak out under high pressure situations. I guess it's because past accidents have shown that Hannah is incredibly resilient and virtually unbreakable, so I was trying to take this one a little more calmly than the others. While I snuggled her tight and tried to calm her, I had Laura look at her face to determine what was bleeding and how bad it was. Locating the cut was easier than determining what to do about it. We ended up heading next door for a professional opinion. Amy wasn't home, but Nate was and he's an EMT so that's the next best thing to a nurse practitioner in my back. He suggested we err on the side of caution and call the pediatrician so I did, after all, this is her face we're talking about. The nurse who answered my only semi-panicked phone call also suggested I err on the side of caution and take her in to the ER. Hannah was still screaming pretty loudly and there was enough of her blood on my shoulders now for the adrenaline and worry to start creeping into my system. I cannot even begin to describe how grateful I am that Laura was there with us. Her presence not only made the whole experience easier, but it also kept me in a relatively put together position. She even drove my car so I could ride in the back with Hannah. I think both Hannah and I would have been much worse off if I had to strap her into the car seat and leave her in the back alone. Even with her sitting still in the car I couldn't get a good look at the cut and was still wondering if I should even be taking her to the ER, if maybe I was overreacting. The guys who took her stats in the first room seemed to think it was "just an abrasion" so I was starting to feel a little embarrassed. I decided that even if it was something small that didn't warrant a trip to the ER, at least they'd be able to clean her up and sterilize her which was more than I was going to be able to do considering how strong and squirmy my child is. While waiting for the pediatrician, Hannah fell asleep on me. It was nap time and she'd been screaming pretty hard for a while. She stayed asleep while the pediatrician inspected her face which was awesome because prior to that, she buried her face in my chest when anyone tried to look at it. 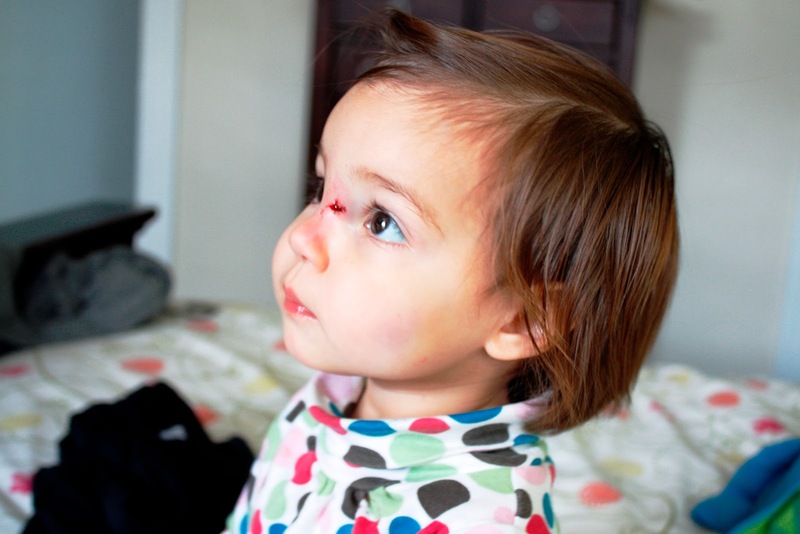 He recommended a stitch because it's pretty deep in one part and it's her face, her beautiful little perfect face, and who wants a scar on their face? He made it sound like stitching it would ensure a less bad scar. A dramatic ER shot taken right after she woke up from her nap. Then we had to talk about numbing agents...They've got some gel thing they use but Hannah would have to sit still with it on her face for 25 minutes and not touch it....The stitcher lady seemed to think that wasn't likely, and I had to agree with her. She said it'd be silly to use a needle because Hannah would have to get stuck with the needle twice to numb it and then she'd get the stitch for a total of three prick. Or we could forgo the numbing and she could just get one stitch. 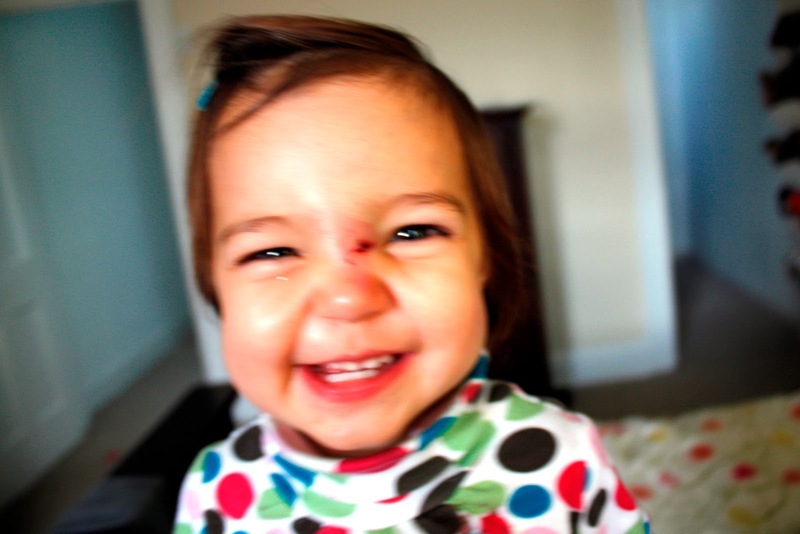 It was settled: Hannah was to receive one stitch with no numbing agent/pain killer. I was second guessing these decisions left and right. Part of me wanted to just pack up and head home and return to the time when it was probably just a small cut that would be fine. It went from being an abrasion to a laceration in a matter of 30 minutes. They readied their little room and then called for me to bring in Hannah. She was immediately swaddled very tightly in a sheet to pin her down. An orderly held her head straight, and I held her legs. Hannah screamed, I sobbed. I tried so hard to tell her it was okay, but she wasn't looking at me or listening to me. She just kept looking back and forth to the lady with the plastic shield over her face who did the stitching and the orderly who had her pinned. She looked so scared. I really can't think of a worse experience in my 30 years of life. And then it was over. We went back to the little curtained room where Laura was waiting, and I nursed Hannah. Afterward she was in good spirits so I put her shoes on her and let her walk out of the hospital. Well, I let her walk until I saw a creepy guy on a bed in the hallway clutching one of those sausage shaped plastic containers (bed pan? puke pan??). That grossed me out so I picked her up and hightailed it out of there. We were the only ones in the ER when we go there so it had seemed like a nice, clean place, but people were showing up as we were leaving so no need to linger! Hannah seemed unphased by the whole thing for most of the rest of the day until bedtime when she clung to me a little longer than usual. I'm hoping she sleeps well because that was a lot of stress and her nap today was very short. Having a snack back at home. You can see her wound pretty well in this one as well as the bruise on her cheek. The stitch continued to bleed all afternoon so that's why it looks open like that. Blurry and obviously not a good photo, but evidence that her spirits did bounce back pretty quickly after getting stitched. Oh my golly my poor little banana!!!!! And poor terri too...goodness. Well the good news is at least you knocked out your first bloody trauma/first er visit/first stitch all in one day! Way to overachieve as usual. Give banana a big smooch for me, she's still as adorable as ever, stitch and all. Awww, I just want to hold her and give you a hug. So sorry that happened. It is times like these I wish I could reach through the screen and be there. Yay, that all turned out as well as possible. Hugs. Oh my bruised little baby Banana! Poor thing. Funny, I had a dream about Hannah last night. She was locked in a car in the sun and I couldn't get to her. It was terrible. I don't like being away from you guys. On the bright side, everything is going well here and I'm taking tons of pictures. Miss you guys! Ahh!! What an ordeal. I am glad you're all back at home. But man, the decision with the numbing agent, etc., I can imagine how hard that would have been.